I'm unbelievably happy with Tama's last litter: disposition, conformation, friendliness, drive, and willingness to work. And I love their funny little personality quirks that all the puppies seem to have; from jumping on the door to go in and out, to using their paws like hands to grab things, carrying a toy in their mouth, and retrieving over and over and over. The whole group is a bunch of incredible little spirits. If you've been reading my blog, then you know that Kona has done well in the show ring. And after this weekend, now Kenji has a Best of Breed under his belt. 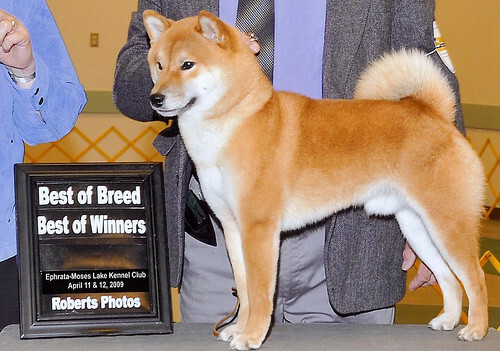 So here's Kenji with his first points and a Best of Breed to boot. Guess it's time for me to really start showing Trixie.